These toys, by rules of religion, were to be played with only on Sundays and were thought of as religious learning tools. It is obvious that this ark and its passengers were rarely played with and retain full details with few exceptions. With a painted exterior to resemble ship boards, and compartmentalized with 3 stalls below deck and 3 above. All major animal pairs are represented as well as a wide variety of birds, crickets and other creatures. Passengers on board included Noah and his wife as well as his three sons and their wives. This particular Ark is an extremely unusual form with a complex configuration, circa 1890-1900. 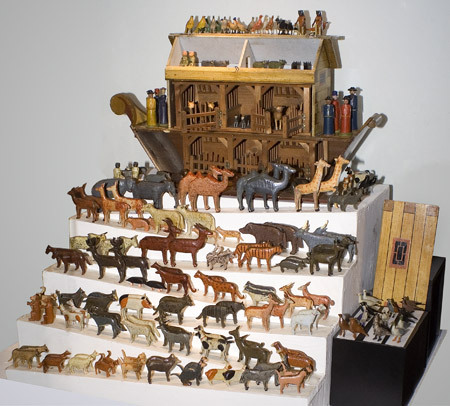 The Ark, in excellent condition, comes with 70 pairs of animals and 23 pairs of birds plus 9 figures making a very large set at nearly 200 total pieces. There are a few strays, but most are in pairs. Dimensions: 24-inches wide, 12.5-inches high, 5-inches deep.